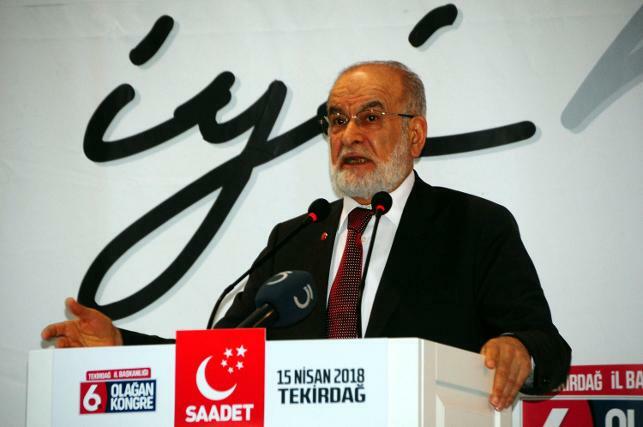 If Turkey’s ruling Justice and Development Party (AKP) was to apply its criteria for detention and arrests to itself, 75 percent of the party would be behind bars, said the leader of the small Islamist opposition Saadet (Felicity) Party, Temel Karamollaoğlu. Speaking at the party congress in the eastern city of Erzurum on Sunday, Karamollaoğlu spoke out against Turkey’s state of emergency, implemented following the July 2016 coup attempt, left-wing Cumhuriyet daily reported. ‘’Hundreds of thousands of people have been affected by the state of emergency … I used to think if the same criteria (for detention and arrests) were applied to AKP members, 60 percent would be jailed. It turns out that was too low. I’ve changed that figure; now I say at least 75 percent would be behind bars,’’ Karamollaoğlu said. The Felicity Party leader said the concept of law had been tainted in Turkey. Turkey's state of emergency was put in place after the July 2016 failed and has been extended six times. During this time more than 150 media outlets have been shut down, some 50,000 arrested and 150,000 people sacked or suspended from their jobs. Saadet Partisi Genel Başkanı Temel Karamollaoğlu, partisinin Erzurum il Kongresi'nde yaptığı konuşmada, "O ihtilali kim denedi. Senin getirdiğin insanlar. ‘Ne istediler de vermedik’ diyecek kadar ileriye gittin. Olağan üstü hal döneminde iktidarın kafası karışır çünkü adalet mekanizması çalışmadığı için her türlü iftira yaşanır. Yüz binlerce insan olağan üstü halden etkilendi. Biz ömrümüz boyunca hiç FETÖ’cü olmadık. Makam mevki sahibi olmak isteyen halkı onlara siz yönlendirdiniz. Ben eğer bugün başkalarına uyguladıkları kıstasları AK Partili üyelere uygulasalar bunların yüzde 60 hapse girer diyordum. Meğer az diyormuşum. Şimdi onu değiştirdim 60 yetmez en az yüzde 75’i girer diyorum" dedi.